One of the more interesting things seen at the Paris Spring 2009 Fashion shows was the Chanel guitar and guitar bag. It was a simple black guitar, but itÂ discreetly spellsÂ Chanel on the headstock and has the Chanel logo in the soundhole. It comes with a wide guitar strap in brown, black and white stripe, again with the Chanel logo on the leather detail and a white, quilted leather guitar case. 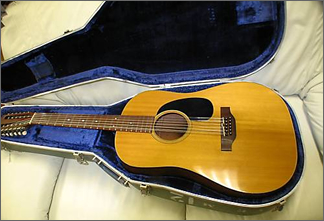 The nylon strung acoustic guitar retails for a mere Â£2800, including the bag and strap.